Eat my heart » Blog Archive » Shall We Dance? I smiled at the teacher’s analogy. I do that a lot. Look ahead. Mostly for trouble and how to avoid it. But sometimes you just have to live in the moment and let someone else steer. No questions. No forecasting ahead. After the teacher’s correction the FC totally responded to my new posture and suddenly we were rocking, twirling, and even mastering a few moves that the other formerly-better dancers were still working on. It was a breakthrough and I felt so giddy and joyous as we swinged our hearts out to vintage rock. 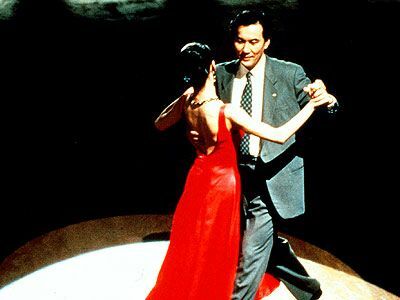 The photo is a still from the film “Shall We Dance,” the Japanese version. The FC borrowed it from the library to warm us up for our classes. It’s a beautifully-directed, funny, romantic film. I loved it. (Don’t bother with the Richard Gere re-make, which doesn’t have the same quirky aesthetic flare. This entry was posted on Saturday, October 3rd, 2009 at 10:17 am	and is filed under Uncategorized. You can follow any responses to this entry through the RSS 2.0 feed. You can leave a response, or trackback from your own site.